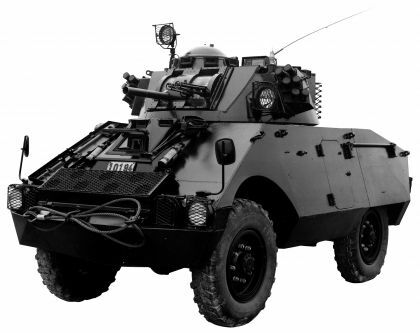 The Belgian FN 4RM/62F AB 4×4 Scout Car was an armoured car developed by FN Herstal SA for the former Belgian Gendarmerie (paramilitary police force). The first prototype was completed in 1962, with production (totalling 62) ran from 1971 to 1972. Its no longer in service. 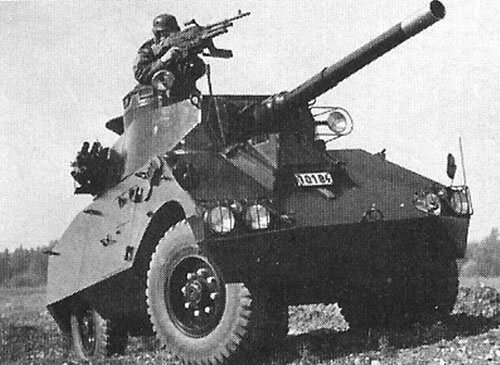 The vehicle is an armoured hull & turret mounted on a FN 4RM/62 Ardennes 1.5 tonne 4×4 truck chassis. The driver sat up front in the hull, then the two man turret and the engine compartment in the rear. FN 4RM/62F ABC (auto-blindée canon) – Fitted with a 90mm main gun and a coaxial 7.62mm MG.
FN 4RM/62F MIMO AB (auto-blindée mitrailleuse Mortier) – Fitted with a 60mm mortar and twin coaxial 7.62mm MG.